“ZETOR tractors have been presented at the AGROmashEXPO exhibition since 1996. This year, we have prepared one surprise for the visitors: the new tractor MAJOR HS is going to be introduced to the Hungarian market for the first time. The tractor was presented to the public early this year; its world premiere has recently taken place in the UK. We are happy to see that in such a short time after its launch, the tractor can be introduced to farmers in Hungary,” says Robert Hajabacz, Director of ZTR AGRO Kereskedelmi Kft. In 2013, the MAJOR model range was launched and soon after it has become very popular with the customers, mainly for its robustness, reliability and versatility. The new MAJOR HS is an extension to the current model range. The marking MAJOR HS is and addition to the MAJOR range, thus making the current model be marked MAJOR CL. 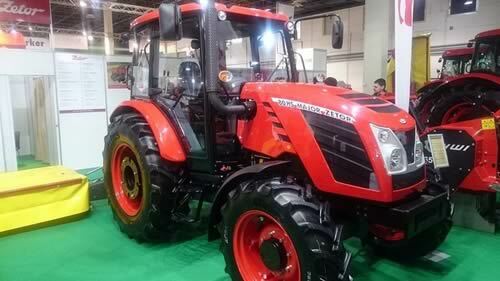 The new tractor is powered by four-engine 2.9 litre engine with 76 hp. The tractor further employs transmission with 24 forward and 12 reverse gears. The four gears of the transmission are complemented with three groups and two-stage PowerShift. Moreover, MAJOR HS is equipped with hydraulic PowerShuttle which allows the change of the direction of motion under load. The tractor reaches the maximum speed of 40 kph, which increases the speed of the basic model CL by 10 kph. The minimum speed is 0.5 kph. Within the operation range from 4 to 12 kph, MAJOR HS offers 6 gears. Other equipment includes hydraulics with mechanical regulation with above-standard lifting force up to 33 kN, 3,300 kg. It also offers fluent regulation of lowering including the hydraulic lock in travelling position. Innovations can be also found in the cabin. MAJOR HS has new steering column adjustable in two directions together with the steering wheel. Operation is also made easier by new dashboard and more comfortable seat with horizontal turning. The location of controls in the cabin is convenient for the operator as they are easily available at hand. MAJOR HS is also equipped with a passenger seat, it has more storage slots and the new dashboard allows tracking of individual parameters. Sufficient lighting of the area around the tractor while working at night or in the dark is ensured by eight working lamps. MAJOR HS has significantly smaller turning radius of 3.9 m, which is allowed by the use of turning mudguards. This makes the tractor easily manoeuvrable also in restricted space. “Bigger fuel tank of 120 l allows the tractor to work for a longer time without pauses,” says Robert Todt, Sales and Marketing Director, ZETOR TRACTORS a.s. “New MAJOR HS is a versatile assistant which can be used both in small and medium farms in the area of animal breeding and crop growing or in community service. Our development has thus reacted to the wishes and remarks of our customers,” he adds. In addition to the presentation of the new MAJOR HS, visitors can also look forward to CRYSTAL 160 which was awarded the judges prize at the AGROmashEXPO last year, as well as to innovated tractors PROXIMA HAS, FORTERRA CL, FORTERRA HD, MAJOR CL 60, and PROXIMA Power 120.